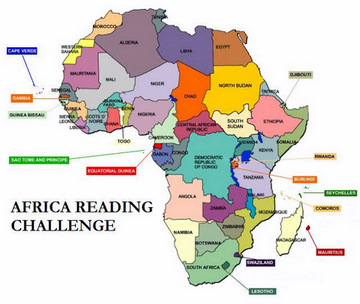 Congratulations on completing the African Reading Challenge or on coming so far!. Please write a completion or update post which list the books you read and any other information that you would like to share. Use the Mr. Linky below to link to your post. If you don;t have a blog, then please leave a comment below. Oh, I seem to have finished. This challenge has been great: without it, I’d never have been introduced to some true continental titans: Nuruddin Farah (‘Crossbones’) and Ahmadou Kourouma (‘Waiting For The Wild Beasts To Vote’), to name but two. I enjoyed Noo Saro-Wiwa’s Nigerian travelogue, ‘Looking For Transwonderland’. I was intrigued by Joseph Brahim Seid’s ‘Told By Starlight In Chad’. And last but by no means least, my favourite book of the year – ‘Azazeel’ by Youssef Ziedan. A little top-heavy on the northern Africa, perhaps, but a good starting point! Thanks for the opportunity! Just want to say thank you to Kinna for the opportunity to participate in this challenge and read so many good books.